The needle and the damage done: Another election night ruined by garbage "data journalism"
On election night, what’s the proper role for political journalism? Of course, it’s easy to say: Just report the election results, and put it into context. But what happens when corporate media — in their zeal to give the public the big picture (and to draw eyeballs) — get too far ahead of the actual facts? Projecting winners in individual races based on official returns, exit polls and precincts left to report is one thing. 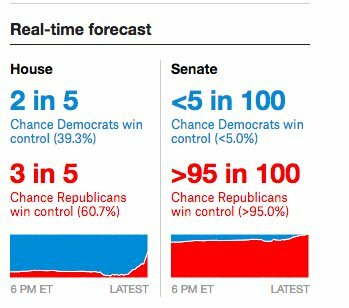 But extrapolating early results to make broad leaps in logic about what will happen hours later, across dozens of states where polls haven’t even closed yet, is quite another. That can be a reckless gambit, one that doesn’t take much to turn supposedly “objective” data journalism into flawed, rank speculation, as anyone closely following the whipsawing election night media narrative last Tuesday can attest. On election night 2016, the New York Times prominently deployed on its homepage a supposed gauge of presidential fortunes. The needle’s now infamous journey, from heavily favoring the odds of Hillary Clinton to preferring Donald Trump as the night went on, notoriously sent chills through many Times readers and the punditocracy. As did its nerve-wracking “jitter,” which was — tellingly — an artificially added dramatic element to make the needle look like it was constantly responding to new inputs. A gimmick within a gimmick, in other words, whose only real mission was to keep its online audience glued to its perambulations. Whether you loved or hated it, the needle’s captivating showmanship made an instant impact. Every one of its shifts, left or right, was soon breathlessly reported elsewhere online and on cable TV. Never mind the oversimplified nature (and ethical complications), it soon became the journalistic totem of 2016 election night coverage, sublimating reporting on down-ballot races and the policy implications of a Trump win under a torrent of mindless needle-watching. So, not surprisingly, it spawned competitors for the 2018 midterm elections. But the tipoff here are the words “attention” and “early indicator.” Though the needles’ projections are based on “intensive, precinct-by-precinct data,” according to Kahn, that doesn’t change that its fundamental missions are to drive traffic and time-on-page by essentially trying to get ahead of the facts. The same goes for the projection that ABC News’ data sub-site, FiveThirtyEight, rolled out Tuesday night. It’s always hard to know, with a live election night model, whether you’ve got things set up too conservatively or too aggressively. But our model really likes how things are going for Democrats in the House so far. But just a half-hour later, after some discouraging results from Florida, FiveThirtyEight’s model had suddenly cut in half the Democrats’ chances of retaking the House, to 39.3 percent. Other sites that follow FiveThirtyEight echoed its projections in turn. Just minutes later, at 8:24 p.m., the popular Twitter account Political Polls (@PPollingNumbers) sent out a tweet — that quickly went viral — estimating the odds of a House Democratic majority had slipped to 30 percent. The failed blue wave media narrative then spread like wildfire. 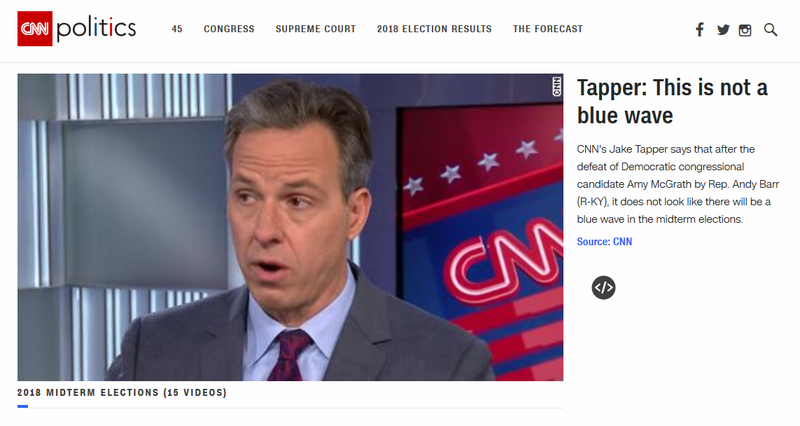 CNN panelists David Axelrod and Van Jones immediately bought into this pessimistic narrative to proclaim “no blue wave,” as did Jake Tapper, after a tough-to-flip Kentucky House seat was called for the Republican incumbent in the 8:00 hour. Fox News’ Geraldo Rivera likewise tweeted “no wave” at 8:34 p.m. The mainstream media’s conventional wisdom on the 2018 midterms outcome was already being cast, in other words, while many of the country’s polling stations were still open. We now know this narrative wasn’t just premature, it was flat wrong. Well, I’m trying to do six things at once – we think our live Election Day forecast is definitely being too aggressive and are going to put it on a more conservative setting where it waits more for projections/calls instead of making inferences from partial vote counts. And while the transparency shown by Cohn and Silver is admirable, their mea culpas prompt a deeper question about the journalistic value of models that purport to peer into the future so fully. Especially if these models can so easily make bold guesses that defy common sense and don’t wait for the actual facts on the ground. To recap, in the span of 80 minutes on election night, the odds of a Democratic takeover of the House went from a roughly 2–1 underdog bet to 50/50 to fait accompli. In the end, it defies reality to think that last Tuesday’s media-manufactured rollercoaster ride was in any way representative of the real-world prospects of the Democrats on election night. 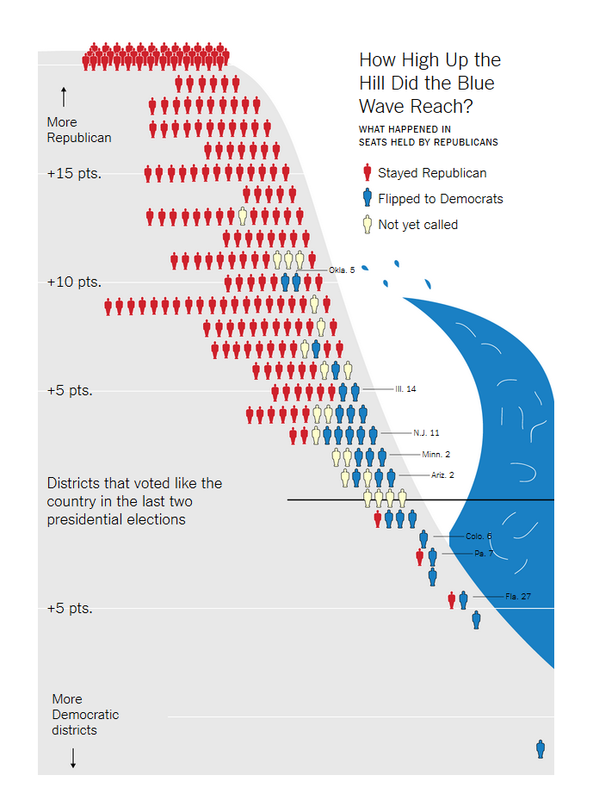 In fact, Tuesday’s results were notable for how closely they tracked pre–Election Day polling, and how the final number of Democratic pick-ups — somewhere around 37 House seats at this point — fell in line with so many middle-of-the-road, simple math analyses. The net effect: Those who had ignored these projections altogether on election night, and just waited to read the final vote tallies the day after, would’ve have likely been better informed than someone who was glued to the falsely fluctuating flutters — and resulting pundit overreactions — all night long. As a result, it’s hard to point to any substantial, net positive journalistic value from these catchy but problematic projection models during this past — or any — election night. Both ABC News and the Times should take a long, hard look at whether all that traffic they’re getting is worth potentially betraying their readers — and the whole media ecosystem with them — for a supposed peek into a future that won’t ever exist.